On January 28, 2017, I tore my right ACL while snow skiing. I was in Ellicottville, New York, my second day on the slopes. I did take a beginner class the day before and had done fairly well. I was in a beginner class the second day, but I was not ready for what they were teaching. I became well aware of this fact but while trying to get down the hill, I took a fall, felt a snap in my knee and became one of the 200,000 people a year who tear their ACL. After my fall, I still skied for the rest of the day and the next day. There was some pain, but nothing that completely inhibited my movement. In fact, I was certain that I had not done anything major to my knee. When I returned home, I texted my Physical Therapist (Burt Reed at Mountain River Physical Therapy in Ocala) and asked “if I tore a ligament in my knee, would I still be able to walk?” To which he responded, “Yes.” Then he asked me about hearing or feeling a “pop.” I knew then I was on the way to an MRI. Some people are actually able to continue life without getting surgery to reconstruct the ACL. These people are known as Copers. In the beginning, it looked like I was going to be a Coper. Burt told me to do some research on it. I was leaning toward not having surgery. After meeting with my first Orthopaedic Surgeon, he even suggested that I not have surgery. He knows my fitness history and was certain I could rehabilitate through the injury and be fine. I started out on the non-surgery route first. But, in February, I attended a friend’s wedding where I tried to dance. Immediately I had knee pain, swelling and was seated for the rest of the night. At this point, I decided that I better start rethinking having surgery. I wanted a second opinion from a Doctor who was a high volume ACL surgeon, worked with athletes and had a low infection rate. This lead me to Dr. Moser at UF Orthopaedics and Sports Medicine Institute in Gainesville, Florida. Dr. Moser also suggested that I not have surgery since I didn’t really participate in any activities where I would be doing cutting movements. That is when I told him that I wanted to be normal. I want to be able to whatever activities I want to do and not be held back by my knee. Then, it was decided I would have surgery. I was advised that using your own tissue when possible is better than using an allograft. 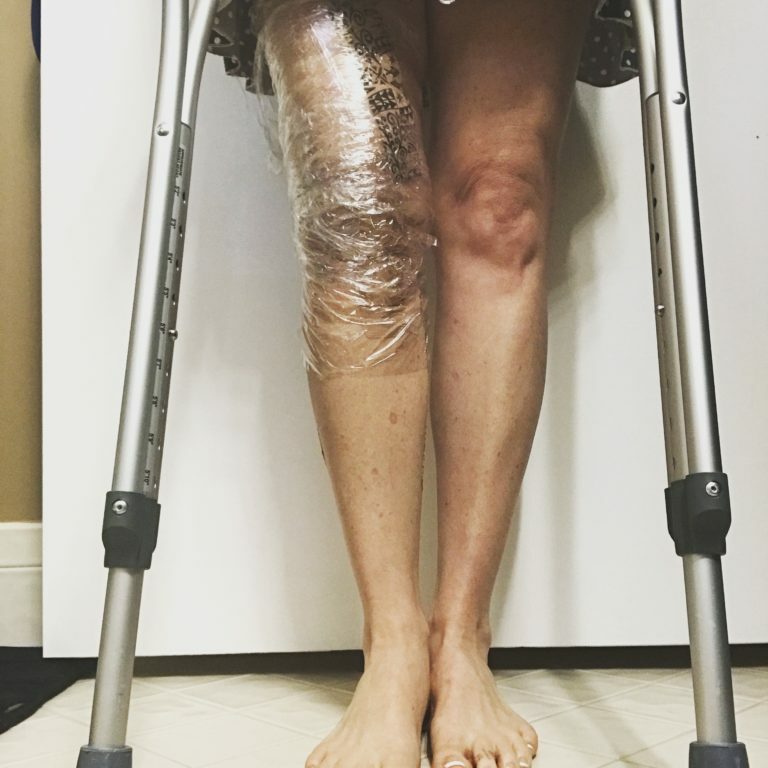 Although I was leaning toward the Patella Tendon Autograft, Dr. Moser explained that since I already have some knee pain (pre injury,) he was almost certain I would experience an increase in knee pain if I chose the Patella Tendon Autograft. He has had much success using the Hamstring Autograft in the high level athletes he treats. I was concerned about my knee becoming lax over time, but the rate of this happening with their active, healthy individuals was low. Because an ACL tear is not an emergency and I was able to function fairly well, it took several weeks before I was able to schedule my surgery. During the interim, I continued to see Burt weekly for Physical Therapy to keep my knee moving and as straight as possible. On May 24, I had surgery to reconstruct my ACL. I chose to have a nerve block in my leg in hopes that it would reduce my amount of pain. I was told the first 24 – 36 hours after the surgery were typically the worst pain wise. In hindsight, I’m not sure if I would choose the block again. I didn’t like the feeling of not being able to move my toes, the tingling, and the dead leg feeling. However, my pain level was fairly low so that was a plus. The surgery only lasts about 30 – 45 minutes. I had no issues that day (besides my nervousness) and once I was alert and able to drink water and walk a little, I was sent home. My leg was bandaged and wrapped, in a straight leg brace with a drain. I was able to walk with crutches and help. I will say, the block makes this difficult and I needed someone to stay with me for the rest of the day. I had to return to Gainesville the following day to have Physical Therapy. I was quite nervous about this because I wasn’t sure what exercises I was going to be expected to perform. The exercises were cake! What I wasn’t prepared for was the removal of the drain. Yikes! It was quite uncomfortable and the drain was way further inside my knee than I realized. Looking back, I’m not sure if it was really pain that I was feeling or more discomfort and disbelief. I don’t watch these types of procedures, but my husband did and he said it was like a magic trick to see how much tube the Therapist was pulling out. I was most worried about the pain of this whole ordeal. Honestly, I haven’t had any terribly painful times. Is there pain, yes. But, it’s not something that has been unbearable. I did use pain medication Wednesday (the day of surgery) through Sunday morning. After that, I only used Tylenol as needed. I did experience a weird sensation in my foot the first two nights of not using pain medication. Almost as if my foot was asleep or numb. That affected my ability to fall asleep and I did take Tylenol PM to help me sleep. That foot numbness is subsiding and I have been able to fall asleep fairly easily. I’m choosing to do my Physical Therapy here in Ocala with Burt. My knee is pretty tired and sore after Physical Therapy sessions with him. The fact is this. You must do Physical Therapy in order to return to your normal activity level. You have to push a little bit when you are trying to recover from surgery. Your brain wants to shut down your normal muscle function to protect your body from “injury.” So, Physical Therapy is going to push your muscles out of their comfort zone in the beginning. If you are an active person who works out regularly, you will understand that a little bit of pain sometimes is a part of getting stronger and fitter. Icing, resting and then doing the exercises at home are helping me to move better. I created a video with tips for getting ready for your ACL surgery. You can view it here. I suggest getting ready for the post surgery. Be prepared! I cooked my meals for the next two weeks. I put the first weeks meals in the fridge and froze the second weeks meals. This was very helpful. I did not feel like doing too much especially not standing and cooking. My husband had to pretty much do everything for me for a week and a half after surgery. I slept a great deal and sat on the couch when I wasn’t sleeping. My energy level was pretty low. Resting and allowing my body to repair was my main goal during this time. Because of the leg brace and the crutches, moving around to do anything was extra taxing. It was much easier to have him bring me what I needed. Showering was a slight ordeal. I had to put on water proof bandages, then wrap my leg in cling wrap. I was not allowed to get the sutures wet. Once that was done, I needed help getting into the shower (we have a small lip in the front of our shower) and I had to sit on a bench. My husband had to spray me down with the removable nozzle so we could keep the water away from my leg. I was terrified of slipping in the shower and falling down. I needed help out of the shower, as well. I did not shower alone for 10 days. Since my ACL surgery was on my right leg, I was not allowed to drive for 3 – 4 weeks. It took me 3 1/2 weeks before I felt confident enough to drive. Coordinating schedules with friends and family helped me to be able to go for appointments, get to work and run errands. One of the hardest parts of this journey has been how it affected me mentally and emotionally. I’ve had some tough days. First, let me tell you that I am a pretty happy and balanced person. I don’t suffer from anxiety or depression and I employ stress management techniques. There were days that I felt so frustrated and very down about my situation. It is hard to be an active person who loves to move and then not be able to do your normal activities. On top of that, with a brace and crutches, it felt like everything took 1,000% more energy to accomplish. I also thought I would be a superstar at physical therapy. I really had in my mind that I was going to crush the guidelines and I was going to move ahead quickly. This has not been the case. I’m actually behind the protocols. I can tell you that as a Fitness Professional and someone who understands movement and the body, this has not been easy to face. It takes a full 6 – 9 months to recover completely from ACL Reconstruction. Around the 8 week mark, the graft is at it’s weakest. It is imperative to be cautious and not do anything that would allow your knee to twist. I felt very vulnerable and nervous at the 8 week mark. It was quite unsettling to know that I could re-tear my ACL and have to do this again. Physical Therapy continues at twice a week with me doing the exercises they practice with me on my own, as well. At the one month mark, I really felt like I turned a corner! I started to feel better mentally, emotionally and physically. I felt like I could move better and was starting to see some progress. I talked about it in a video update on my YouTube Channel here. Currently, I am 15 weeks out from my surgery. I am feeling much stronger now. I am still behind on the protocol and am having issues keeping my knee straight. I started some lower body exercises this week in conjunction with my Physical Therapy Exercises. I am definitely weaker in my right leg and I have issues squatting normally. I really have to concentrate on staying aligned and using proper form. My knee pain is just soreness after exercises and therapy. There is some discomfort when I am trying to squat. Lunging is out of the question as it feels very uncomfortable. I am able to do Yoga and finally can safely and more comfortably do Pigeon Pose. Warrior poses are difficult because of the lunging and Triangle pose is difficult because my knee does not want to straighten. However, I have seen gradual progress each week as I do Yoga. I will continue with my Physical Therapy twice a week. Next week, I go to get my quadricep strength tested to see where I am. Protocol is that it must be at least 60% of the strength of the non-injured quadricep in order for running to be introduced into my therapy. However, I’m certain I am not going to be at that level, yet. I’m fine with it. I’ve come to learn to be patient through this whole ordeal. I just have to do what I am told to do by the professionals and allow my body to heal and progress at it’s own rate. It’s not a competition. This is a long process. Since I’m not finished, I’ll continue to update this blog post until I am cleared for good! Hopefully this can help someone who is just starting out. Day 1: Physical Therapy in Gainesville. Easy exercises. Drain removal was terrible. Day 6: PT in Ocala. Added lying down flat on the bed and letting my foot hang before starting my exercises. This helps straighten my leg before I do my Quad Contractions. Day 7: Sore as all get out. PT has fired up my hamstrings and my knee. Feeling soreness where the bone was drilled and the “hook” is located. Still had to do my PT exercises. Had a cry fest as the pain was bothering me before I even started. Still not excruciating, but definitely uncomfortable. Day 8: PT in Ocala. Burt says my pain is normal. Much better today at straightening my knee. I can actually push my knee down slightly as I contract my Quadricep. Day 12: Returned to Gainesville to have the stitches removed. Still no swimming or full immersion in water for 3 more weeks. Day 20: Cried myself to sleep tonight. I’m supposed to be off of the crutches but I am still using them. I’m frustrated with my lack of progress, how hard it is to do normal things and the pain in my knee when I do therapy. Day 26: I DROVE TODAY! So excited to be back to driving and not having to depend on someone else for a ride. Day 28: I feel like I finally turned a corner today! I was able to straighten my knee more and I feel like I’m moving better. There’s light at the end of the tunnel! Day 37: Took my first flight since surgery. I had to wait a month after surgery before I was able to fly. Not too bad and people were very helpful. Just tired from all the walking with one crutch while carting a bag and a backpack.